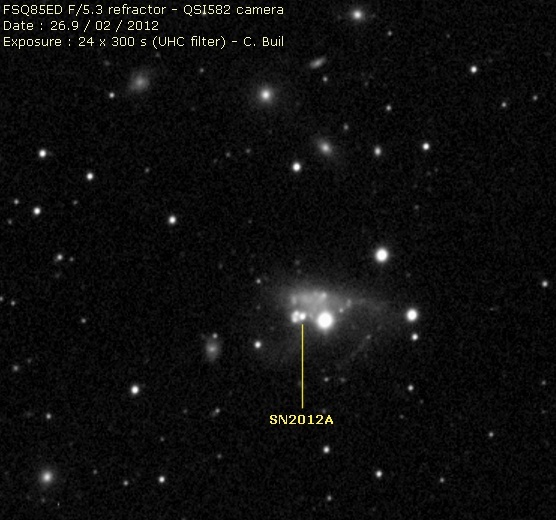 2D image of SN2012A. 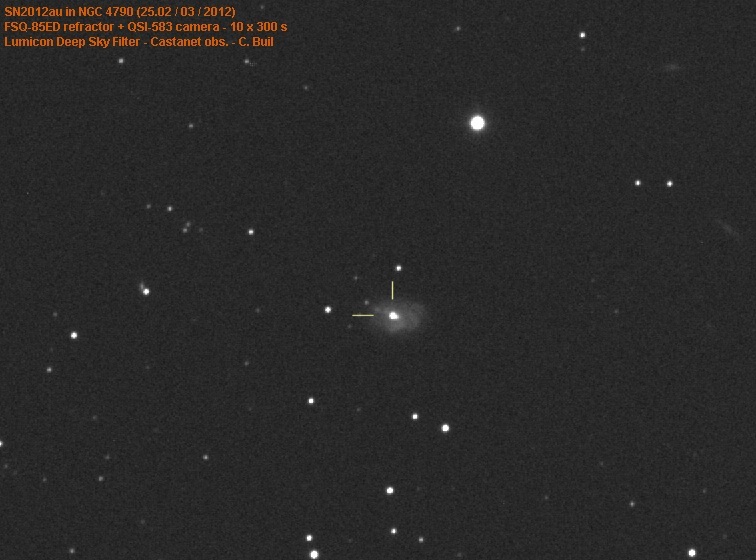 The supernova seem embedded in a faint emission nebula (note also the faint trace of NGC 3239 spectrum in the upper part of the image). 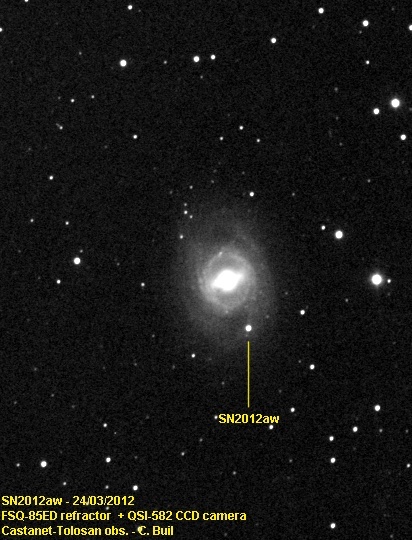 Field of NGC 4790 and SN2012au (near the nucleus). 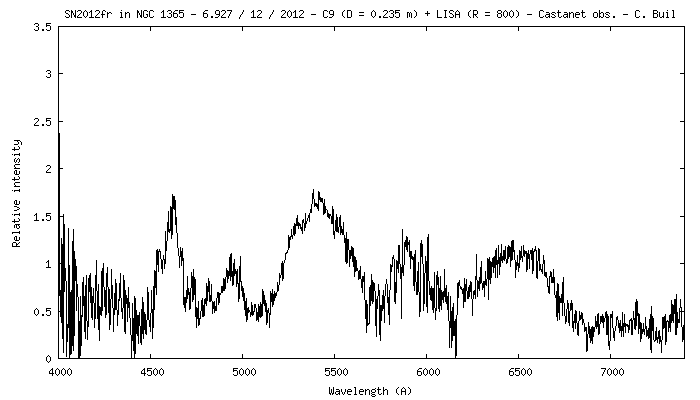 Logarithm display. 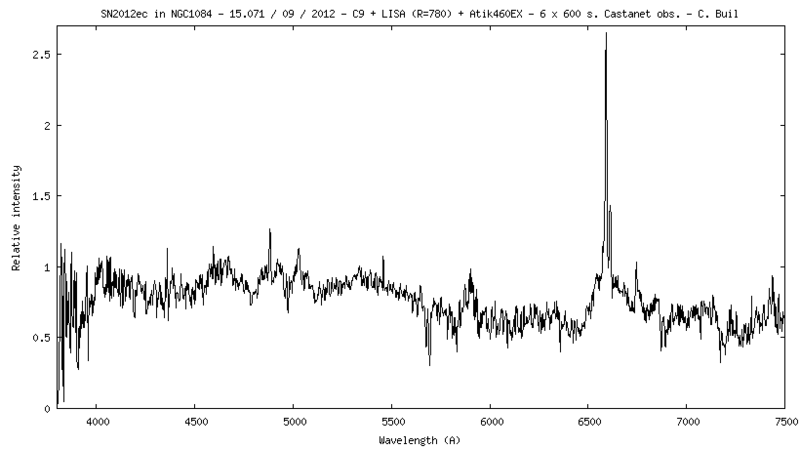 SN2012aw image the 24.9/03/2012 - Lumicon Deep-Sky Filter + IR-cut - 18 x 300 s.
Very faint 2D trace spectrum of SN2012bm taken the 29.945 / 03 / 2012 with a C11 telescope (D=0.28) a LISA spectrograph at R= 1000 and a 13 x 600 s exposure (suburban condition). 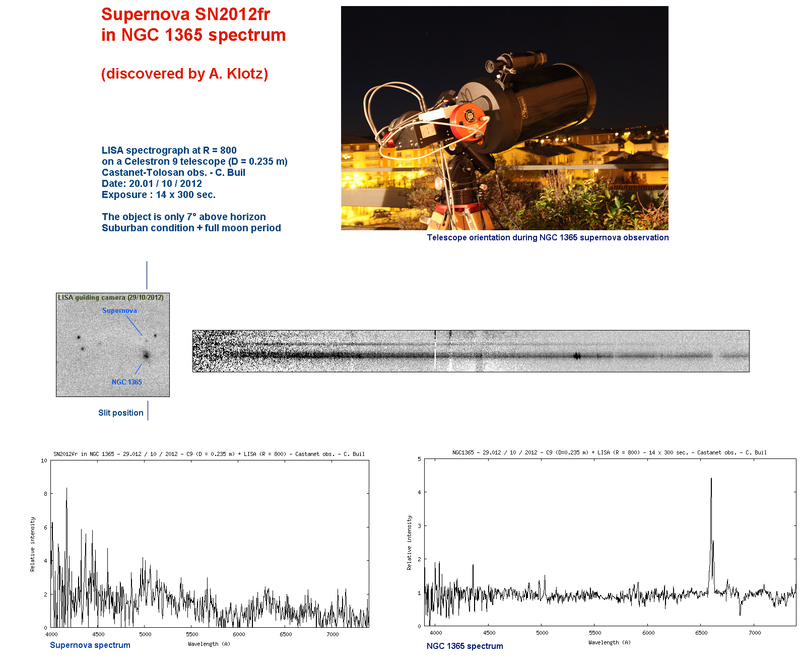 SN mag. 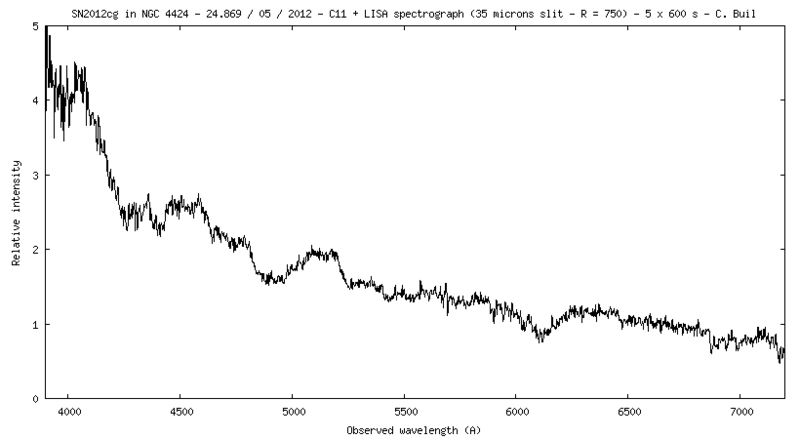 V=17.1. 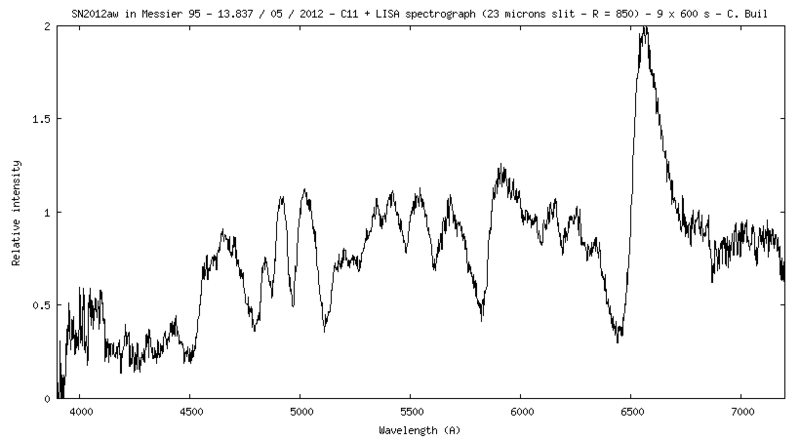 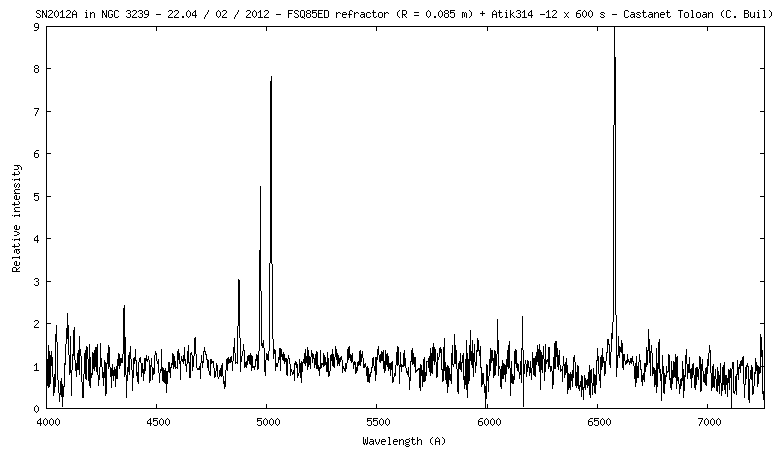 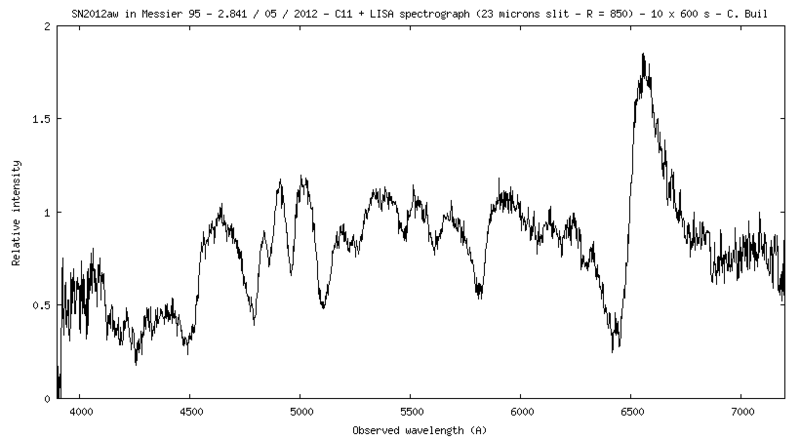 The extracted spectral nearly at the detection limit for the March 29.9, 2012 date. 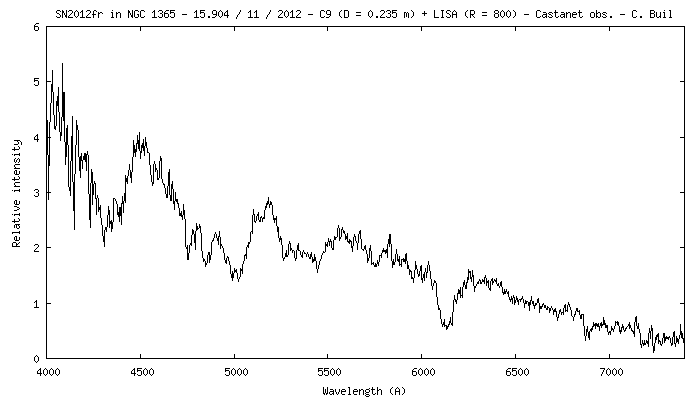 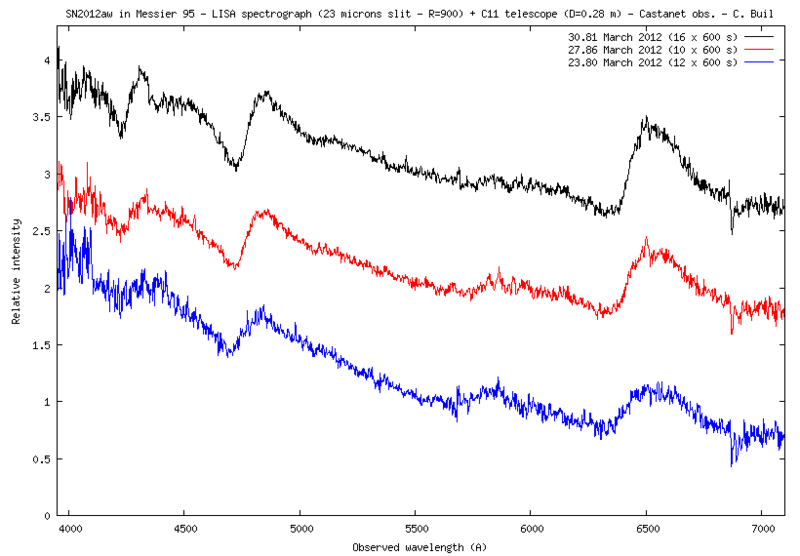 LISA spectrograph guiding camera - 35 microns slit - Castanet-Tolosan obs. 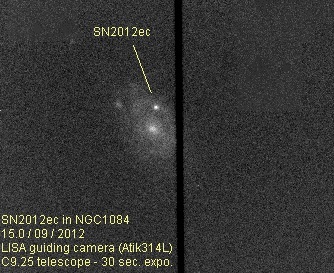 2D spectrum image of supernova SN2012ec and galaxie NGC 1084 (note presence of numerous HII emission lines). 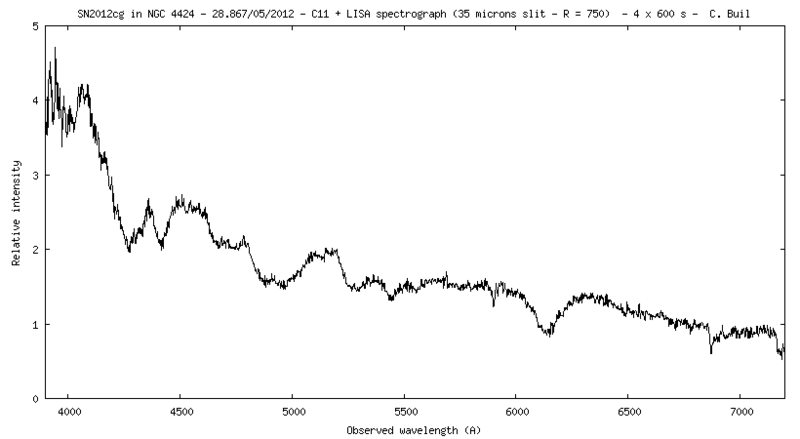 15.0/09/2012 (cumulative integration time: 6 x 600 sec.). 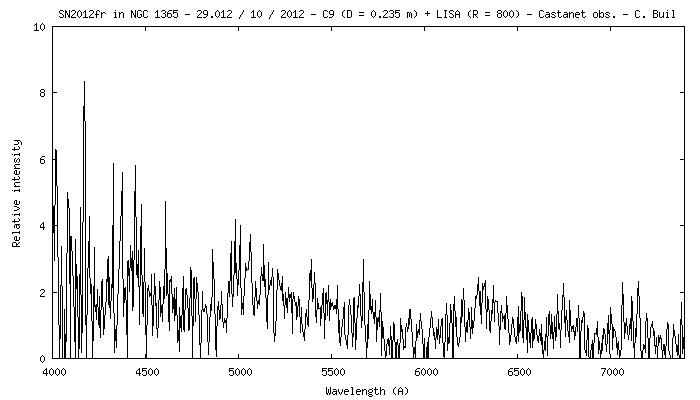 2D spectrum of SN2012et and host galaxy. 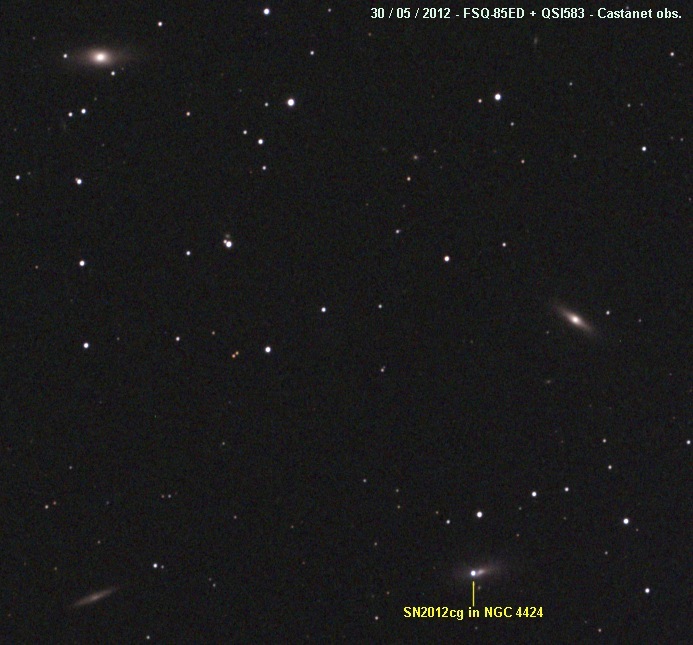 14.98 / 09 / 2012 - Total exposure 11 x 600 sec. 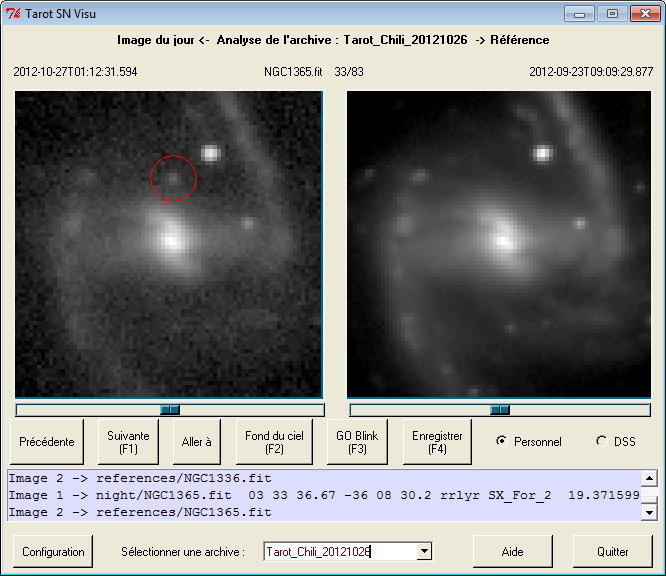 using public images of the 0.25m robotic telescope TAROT La Silla observatory, Chile. 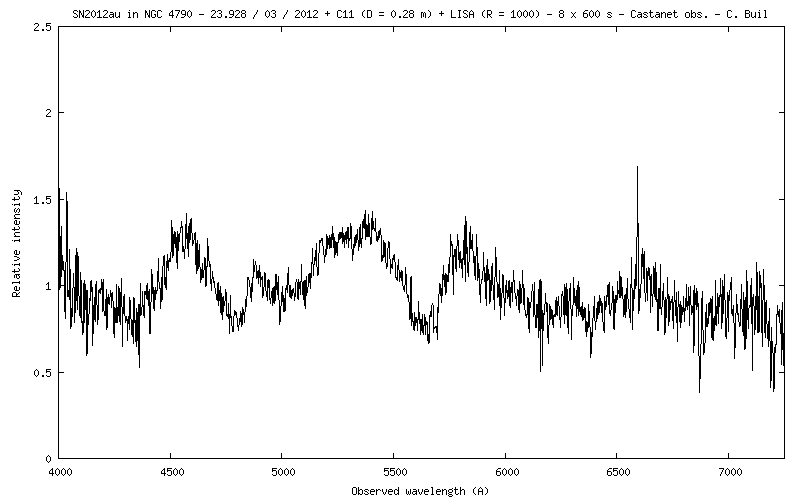 Image from the LISA spectrograph guidance camera (Atik314L, stack of 2x 60 sec. 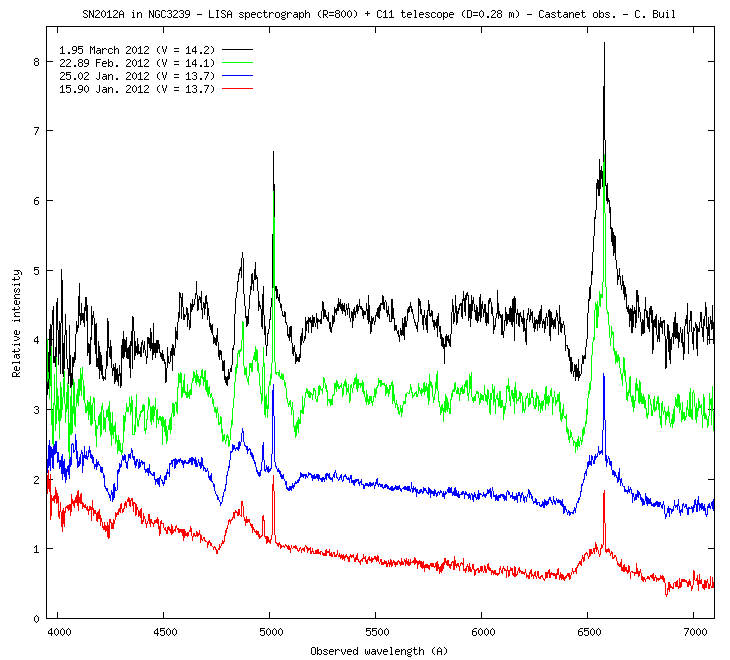 exposure) and of the 2D spectrum (stack of 14 x 300 sec. 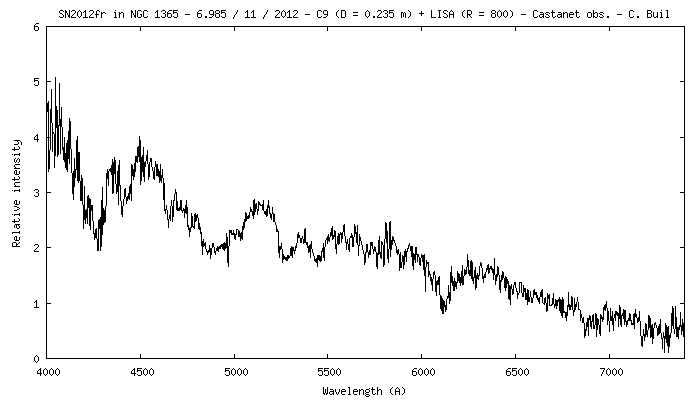 exposure - Atik460EC CCD camera). 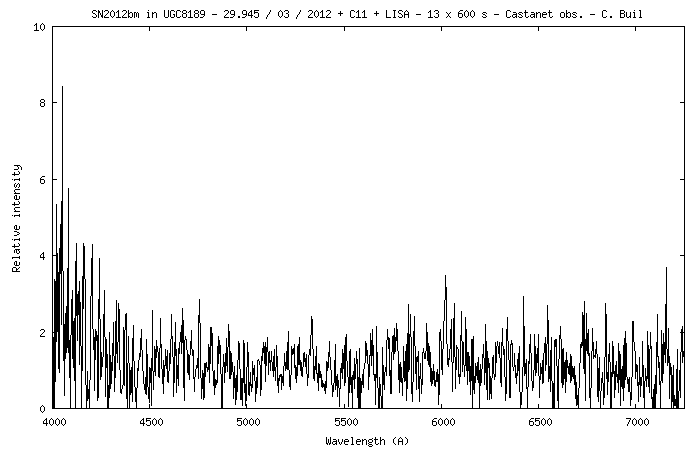 Observation is complex from Castanet-Tolosan observatory (south of France) because the maximum elevation above the horizon is only 7°. 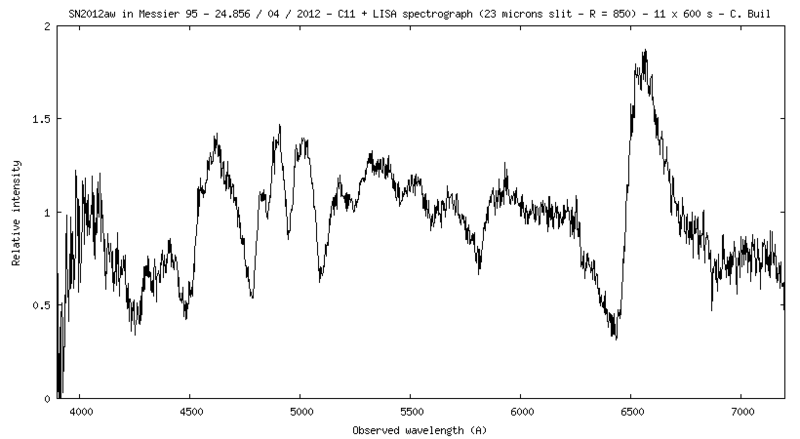 Also, the artificial light pollution is severe from the observatory and the date correspond to full moon period (see conditions here). 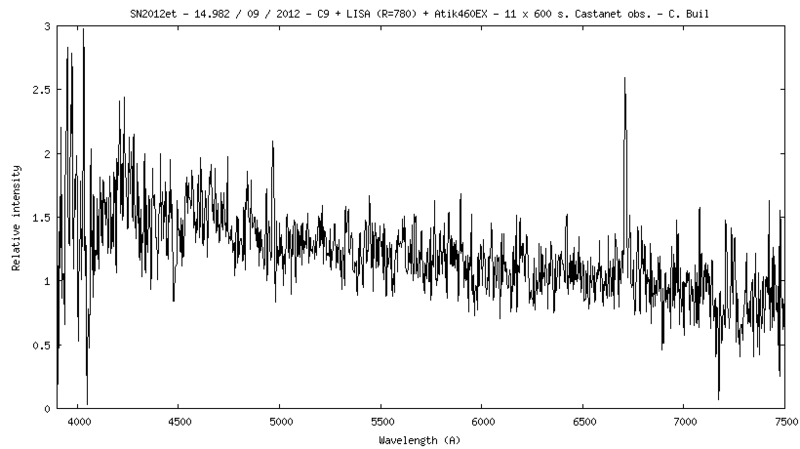 Spectra of SN2012fr in NGC 1365 (the atmospheric extinction is corrected by observation of star HD38170).